Political scientist John Mearsheimer wrote a book on the tragedy of great power politics. While that subject is indeed shockingly depressing, imagine the tragedy of small power politics. 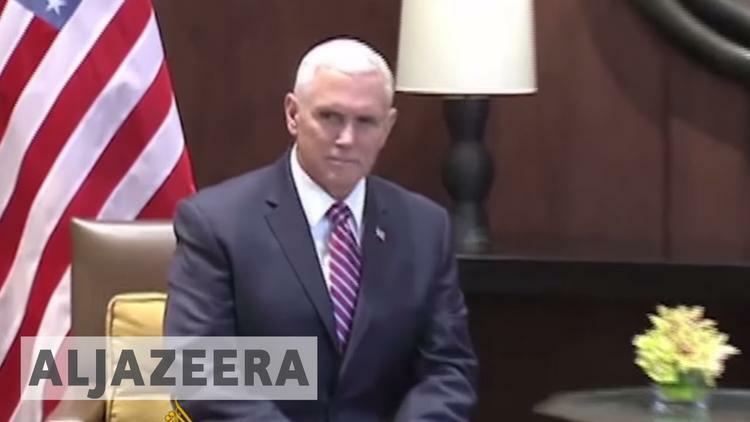 Poor King Abdullah II of Jordan was forced to host Trump’s vice president Mike Pence, the world’s biggest Christian Zionist, who positively exulted about turning all of Jerusalem over to Israel’s far right government headed by Binyamin Netanyahu. Jordan is in charge of the major Muslim shrine complex on the Temple Mount, the al-Aqsa, and is a major diplomatic player in the Israeli-Palestinian negotiations toward a final status settlement of the position of Jerusalem. (Jerusalem was never awarded to Israel by any international body, and it has it only by conquest, which is prohibited by the 1945 UN charter). East Jerusalem is heavily Palestinian and hasn’t had a Jewish majority since the Romans kicked the Jews out of the city in 136 AD. Abdullah went on about US support for Jordan over decades (the US had seen the small kingdom as an anti-Communist, anti-Arab Nationalist asset during the Cold War, and then as a useful ally in the War on Terrorism since 2001. Jordanians generally despise Muslim extremism as much as they do Marxism, being mostly good burghers). He said he had been encouraged by Trump’s announcement that he would try to make the deal of the century between the Israelis and the Palestinians. But then he was disappointed by the lack of follow-through and then by the unilateral awarding of Jerusalem to Israel, when instead the final status of Jerusalem should have come out of negotiations among the relevant parties. Abdullah’s subdued, sullen complaint masked fierce rage in Amman’s palace, as well as severe anxiety about what Trump’s policies will mean for Jordan’s own stability and for that of the world. The ignoramus blowhard Queens building contractor Trump and the mendacious Midwestern Christian Zionist tobacco lobbyist Pence could end up costing Abdullah II his head, and could end up provoking a new generation of terrorism. Jordan has 6.6 million citizens and 9.5 million residents (i.e. a third of the resident population are guest workers or refugees– over a million Syrians, 600,000 Egyptians, a similar number of stateless Palestinians, and the rest Iraqis, Yemenis, Libyans, etc.) Over half of the citizen population is of Palestinian heritage, who typically have strong views of the ongoing Israeli colonization project in the Palestinian West Bank. Jordan, in short, is a cauldron of the flotsam of imperial projects, from the British surrender of the Mandate of Palestine to the Zionist lobby and the subsequent displacement of the majority of the Palestinian population as refugees to neighboring countries, to the American wars and occupations in Iraq, the Russo-Iranian enabling of the al-Assad regime in Syria and all its ethnic cleansing, the Saudi misadventure in Yemen, the fecklessness of NATO in Libya, the economic mismanagement of the Egyptian economy. It is a little astonishing that this small fractured place, with a citizen population the size of Mike Pence’s Indiana and a total resident population roughly the size of Michigan, manages to hold together. It has few economic resources on the surface. There is however a massive black economy. And although the Jordanian government might not recognize it, the refugees have brought in tremendous wealth–though of course large numbers of them have lost everything and receive little in the way of international aid. Jordan’s political framework is the Hashemite monarchy and its somewhat opaque police state, both backed to the hilt over decades by the United States and since the 1990s, Israel. The state is popular to the extent that it can provide security to its people and a framework within which this nation of refugees can improve their lives and navigate among the dangers all around them– an arrogant and expansionist Israeli rogue state, a seedy Stalinist police state in Syria, an erratic and increasingly hegemonic Saudi monarchy, and a grasping and profoundly ignorant United States, Inc.
What Abdullah II is afraid of is that his American alliance, always unpopular among much of the population, and the peace treaty with Israel concluded by his predecessor in the 1990s, will tag him, finally, as a traitor to Islam and to the Arab nation–as it becomes increasingly clear that Washington and Tel Aviv intend completely to crush Arab and Muslim aspirations for a Palestinian capital in East Jerusalem and to do to the al-Aqsa mosque what they have done to the shrine of Abraham at Hebron. Looking into Pence’s cold, calculating imperialist eyes, Abdullah saw a guillotine with his name on it.